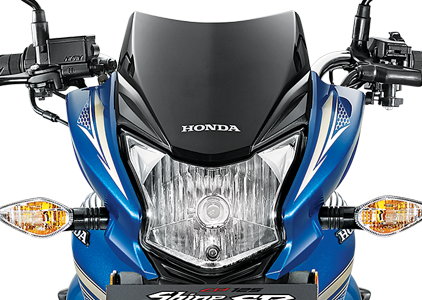 Honda releases yet another solid offering, the Honda Shine SP. Well this is a very good idea of investing in the commuter category in India, because majority of the bikes being sold in India are commuter bikes. Honda upgrades the old Shine to replace it with a new stunning and beautiful design. Let us see how this bike fares. We all know how good the old Shine was, and here too this new design is quite appealing and I would say easily the best designed commuter bike in the country today. The new aesthetically built headlamps, bigger fuel tank, new chrome-plated exhaust muffler, the new split alloy wheels are truly one of those eye candy cosmetic upgrades which makes this bike more beautiful and more contemporary at the same time. Every time a new upgrade is carried out to an already existing design there is a lot of risk in it. You need to be up to the mark to really be on top, if the new design has to be liked more than the previous design. I think Honda designers have done a remarkable job here in making a new sporty design which makes the old Shine look somewhat primitive. This is truly a design which will go well with the commuter customer bracket. The design is something the new owners can brag. The design is not the only thing which makes a bike the best in class, there are a lot of other parameters to it as well. 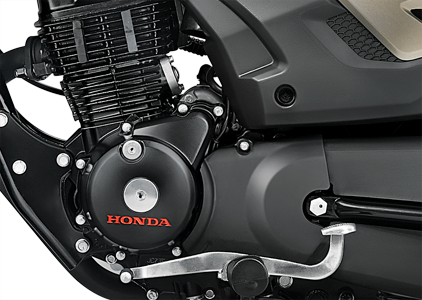 The engine performance, the handling and the mileage are some important aspects on which a bike truly fares upon. I am going to give a clear idea of how the bike is, from its switches to its performance and let you understand its real story and help you in deciding whether or not to go for the bike. Before actually writing anything about the design the fact that this is a commuter bike, the aesthetics will only be judged by keeping a 125cc commuter bike in mind. When you actually take a first look at the bike you will obviously come to know that this bike is designed for the broader 125cc midrange commuter segment and nothing more. But when you actually judge it according to its looks it is something really cool and amazing. I don't know what part of the bike has done this magic to it or may be the overall cosmetic upgrades may have done this, but this bike looks amazingly beautiful. The design is good and has a lot in it to make some heads turn. The head lamp looks new and has been designed in an "M" shaped design which looks new and also gives a lot of sportiness to the overall look of the bike, the fuel tank is designed a bit taller and also looks bigger and beautiful and has less cartoony, funky graphics around it which makes this bike look premium. The new split alloy wheels may not be a lot attention grabber to some people but I like the way it is designed and has given the bike a new look. The tail section too looks a little bit more polished rather than the old primitive design. The chrome-plated exhaust muffler is the last thing I want to speak, everything else is good. Now there are some things I really didn't like. One is the quality of the plastic used for the switches which are truly poor. Had they improved the quality, it would have done justice to the overall look of the bike. The digital- analogue instrument cluster is good but overall, the digital meter would have been better. Apart from this everything is good. This new digital-analogue console is a welcome move to the Honda Shine ecosystem. 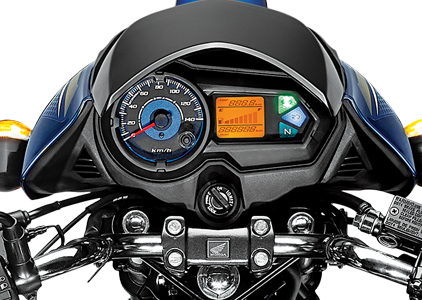 This is designed well no doubt about it but as I said earlier the digital meter looks dated and also a bit like the digital console which we would find on the Passion Pro which makes this bike's console look really pathetic to me, otherwise overall it is a good package. Practicality it is good but the look is pathetic, and if I were the designer in charge, I would have something new to do justice to the overall look of the bike. The Honda Shine SP has a 4 Stroke, Air-cooled, 124.73cc engine generating a maximum power of 10.57bhp@7300rpm and a maximum Torque of 10.3 NM@5500 rpm. If I were to really have a say about the engine I would say it is quite good from the 125cc standards. The engine is the same as the old bike. The engine is quite smooth and has enough power to really enhance the riding experience. Taking into consideration that all the potential buyers are from the commuter category and has nothing to do with sports here, the engine is clearly made for the large consumers out there and this engine performs really well. One thing I need to mention it is that, starting the engine in cold conditions can be a bit irritating at times as is the case with a lot of Honda bikes. If you look into it as a 125cc engine it is pretty good. Revving too is pretty good. Overall the engine is a good performer by 125cc standards. The ride quality too is good and comfy making this a good performer in the ride and handling as well. The suspension is good, not that great to be frank but still does the job well. The front disc brake is pretty good and the rear drum brakes too have enough bite to let you to be in good control all the time. The posture too is more of a formal like and has nothing to do with wrist pain and also back pain. If you happen to use a basic commuter bike you would truly enjoy the experience but I truly encounter a lot of problems with the seating posture of bikes like these. For a normal office goer, or a family man, this is going to be perfect. The bike also comes with a CBS variant and handling will be even better on it. Honda claims a mileage of 65kmpl which is quite good for this category. As we all know claims are just claims and actual mileage figures may vary, you may get around 55 kmpl in cities and around 60kmpl on highways. You can extract even more from this machine if you follow some basic riding tips. The Self Drum Alloy is priced at Rs.59,990, The self-Disc Alloy at Rs. 62,400 and the CBS Model at 64,400 (all prices ex-showroom Delhi). For some it may be a bit overpriced, but I think it is worth it. Excellent eye-catchy design, good engine, good ride quality, Good mileage. Cheap plastic used for switches. The bike is excellent enough for commuting with good engine, design, mileage, and the overall ride quality. Your riding experience is going to be good. If you are looking for a good commuter bike with good performance, this is the bike for you. Studded with arguably the best design in the category, I would say this is a good option.